Dallying In The Dirt, Issue #199 --- The pond bubblers are in and winter can now arrive. Well this week we have had a couple of winters, an autumn or two and whatever else the weather gods want to throw at us. I did finally get both the rain barrels emptied and the last of the planter beds cleaned up. The large Canna between the ponds had its top removed but the rhizome is staying in the ground and I will try to pretend that I’m doing a hardiness experiment. I have bubblers in two of the ponds but I haven’t quite made it to the bubbler store to buy a new pump to replace the one that died last year. I’ve only had about seven months to do it but it wasn’t urgent until this week. I have to replace one of the air hoses as well because it developed a leak in the middle of last winter and the lack of air going into the bottom pond managed to kill almost all of the fish in that pond. 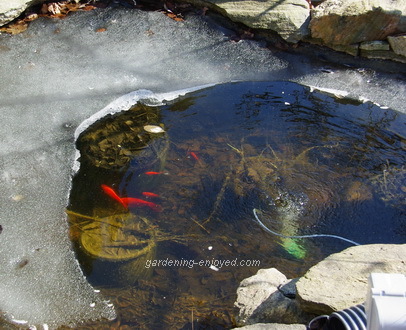 I know people that put floating heaters in their ponds to keep the ice from totally covering it but I have found that the bubblers work just as well and although they don’t keep the water from freezing over in very cold weather they do keep the fish alive and that’s the desired result. The big advantage is the amount of electricity that the bubblers use. It’s far less then the heaters. Why would I spend a couple of hundred dollars to try and keep $40 worth of goldfish alive? I have four varieties of Amaryllis this year and have most of them planted. I try to space out the planting so that they are not all in bloom at the same time. The unplanted ones stay in the cool room because Amaryllis kept in a warm room will bloom whether they are planted or not. I know this because some of my grown children have not always planted their Christmas bulbs as quickly as they should have and I have, on the rare occasion, visited in late January to find them happily blooming nowhere near the pot and soil that came with them. They do make wonderful Christmas gifts and my favourite exercise is to spend time helping the younger grandchildren plant them and then encouraging them to chart their rapid growth. You will find Amaryllis bulbs at a variety of prices at this time of year. There are valid reasons for this beyond retail competition. 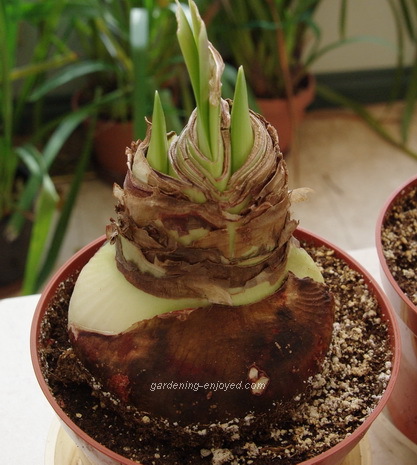 The bulbs are graded for size and the larger ones will cost more because they will produce more flower stalks. Some newer and fancier varieties will also command a premium. I have a bright red, double flowered variety this year called Double Dragon that should be spectacular. The double flowered ones are usually only available in smaller bulb sizes and to compensate for this I will plant 3 or 4 of the bulbs in a large shallow container to make an impressive show. As the new ones are finishing, I will bring last years up from the basement to see how successful I was at rejuvenating them last summer. It’s usually fairly successful. A few weeks ago I planted my dwarf Narcissus bulbs into pots and left them in the warm part of the basement. They are now exhibiting significant root growth and this week I moved them into the cold room. 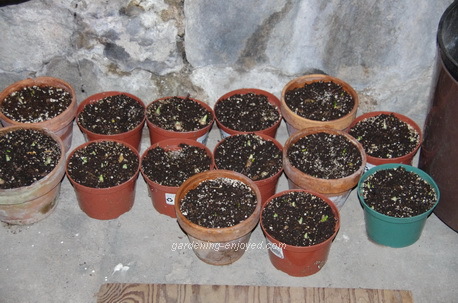 They will rest in there until mid February and then I will start to bring them up to the warm bright kitchen a few pots at a time. This will give me some wonderful little yellow and white spring flowers bursting into bloom to remind me that, despite the snow outside the window, spring is coming and soon the garden will look as bright and colourful as the kitchen counter does. Without that 6 + weeks of cold the bulbs will never break their dormancy and bloom. They may put up some green shoots but if you want flowers you must simulate their winter rest period. In February it’s always worth the November effort. Karl Asks? I have Magnolia in a bit of an exposed position and it didn’t flower that well last year. What, if any, winter protection or preparation should I do for it?